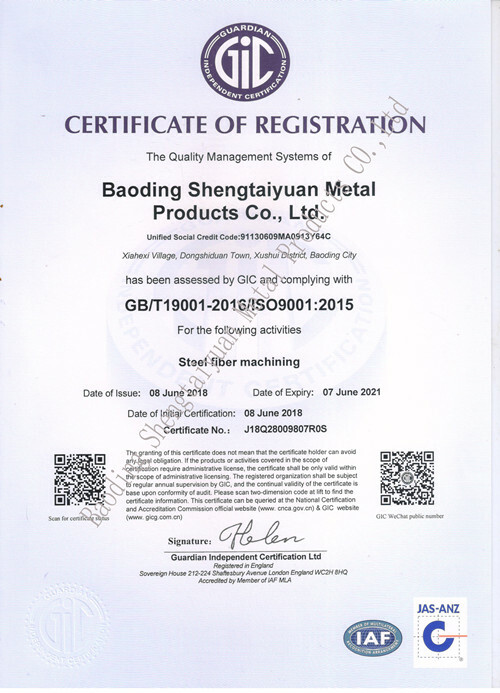 Company Overview - Baoding Shengtaiyuan Metal Products Co., Ltd.
2YRSBaoding Shengtaiyuan Metal Products Co., Ltd.
Baoding Shengtaiyuan Metal Products Co.,Ltd, an ISO 9001:2015 certified factory, has been engaging in producing steel fibres for over a decade in China. We offer a wide range of steel fibres for flooring, shotcrete, precast and structural applications. "HONGDA" is our registered trade mark of steel fibres . We have wavy steel fibre, endhook steel fibre both loose type and glued type, xorex undulated segment steel fibre, flattened paddled ends steel fibre and micro copper coated steel fibre for RPC. All our fibers confirm to JG/T 3064-1999 steel fiber reinforced concrete & YB/T 151-1999 steel fiber for concrete. 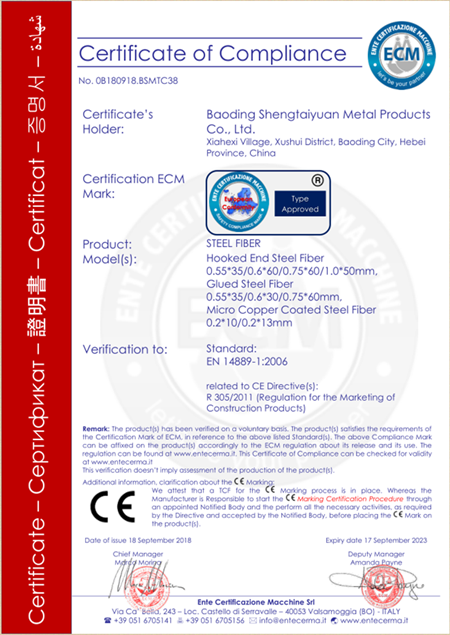 Besides, some kinds also get TEST REPORT OF NATIONAL CENTER FOR QUALITY SUPERVISION AND TEST OF BUILDING ENGINEERING.From the initial establishment of our factory, we endeavour to offer all the customers with high quality products and superior service.Neither your order is big nor small, or whatever you concern about , we will be here all the time for offering the professional solutions.